Scotchy Scotch Scotch…Mmm Mmm Mmm! Loch Lomond Original Single malt – The distillery was built by Littlemill Distillery Company Ltd, a joint venture part-owned by the American distillers Barton Brands Ltd, in 1965 on the site of a former calico dyeworks and Britain’s oldest car factory, the Argyll Motor Company. Barton took over complete ownership a few years later in 1971, but the distillery fell on hard times during the 1980s and was forced to close in 1984. Production resumed in 1987 under the new ownership of the Glen Catrine Bonded Warehouse company, an independent bottler seeking to control supplies of malt whisky for their own-label blends. They operate on two traditional potstills, and one Coffey still for grain whisky production, making Loch Lomond the only distillery in Scotland to produce both malt and grain whisky on the same site. Nikka Coffey Malt Whisky – Coffey Malt is made from 100% malted barley. However it is not categorized as “malt whisky” but as “grain whisky” since it is not distilled in a pot still. This unique production method results in extraordinary flavors and texture. The Coffey Still is the world’s first patented continuous still invented by Mr. Aeneas Coffey in 1830. Masataka Taketsuru valued the feature of this type of still, which retains the flavors of ingredients and also creates a distinctive texture. Coffey Grain and Coffey Malt are Nikka’s signature grain whiskies, from their Miyagikyo Distillery, which show the beauty of the Coffey Stills. Glen Scotia Double Cask Single Malt – Campbeltown, a tiny region on Scotland’s west coast, was once a hotbed of whisky-making, but today there are just three companies with active stills. Springbank is by far the best known. Glengyle/Kilkerran is largely unheard of in the U.S. The third is Glen Scotia, which was built in 1832 but has changed hands and gone through so many owners that few have kept count. The current owner is Loch Lomond, which produces whisky under its own name as well. Kaiyo Mizunara Oak Whisky – Kaiyo is a negotiant bottler started by a drinks group led by former Asahi employee Mr. Watanabe. He was able to purchase “teaspooned” malt whisky barrels from an unnamed Japanese whisky supplier via his connections in the industry (“teaspooning” is when a distiller adds a teaspoon of another whisky into the barrel before selling it, thus preventing the purchaser from claiming it as a single malt from that distillery). 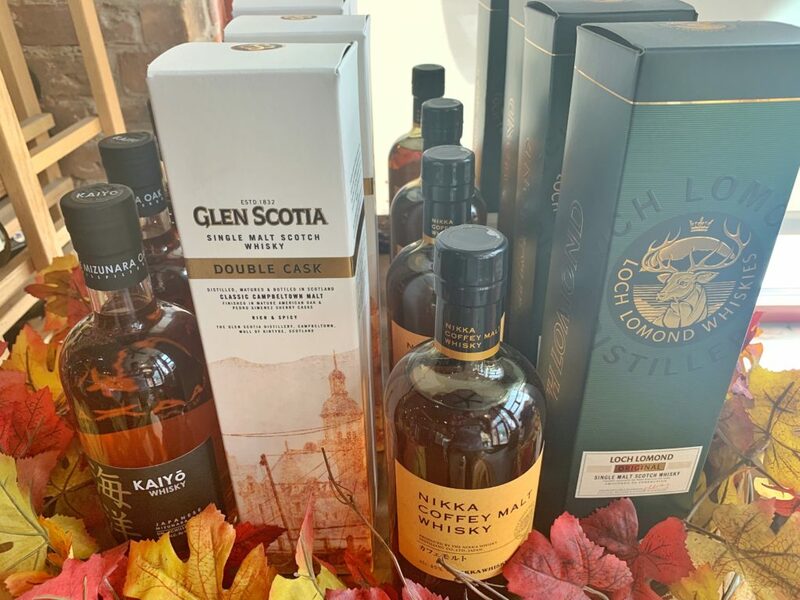 The whiskies are purchased as teaspooned new make (unaged distillates) and then put into Japanese Mizunara oak barrels from Ariake, considered one of the best manufacturers in the world (each new Mizunara barrel costs between $6500 – $7500). For those unfamiliar with the legend of Japanese Mizunara oak, it’s become heralded in the whisky world both for the exotic flavors of incense, sandalwood, and coconut it passes along to the spirit as well as its expense. Difficult to cooper and notoriously inefficient as a vessel, editions of Yamazaki and Bowmore aged in Mizunara wood have sold at four figure prices, making the Kaiyo whiskies in comparison seem like a steal. You get an exotic note of tea and faint orange peel on the nose of the standard Kaiyo edition, but the soft and rather delicate palate brings more of the vanilla and oak character. The spices come out on the finish with lots of pepper and oolong. It’s very Japanese in its restraint, graceful from front to back without any serious peaks or valleys.